You're a guy who's been lifting weights and doing strength training. As your muscle mass increases, you notice you start to get stretch marks. Rumor has it that men don't really care much about stretch marks, but you'd be surprised how many men on forums all over the web are concerned just as much as women. You're a woman who's given birth and although you love your children with all your heart, you hate the scars that have resulted from that magical moment. You no longer want to wear tank tops during the summer and even though you've lost the weight you're just too embarrassed to wear a pair of nice shorts. Both of these issues can be solved with what's called a dermaroller. It's a plastic roller with needles that can be used to help increase the collagen levels of the skin. When stretch marks appear, it's because the skin isn't as elastic as it should be. Beneath the stretched areas are simply skin that isn't flexible. It's really simple and not as painful as people might think. Gently roll the needles over your skin that has been affected for 2-3 minutes per day, five days per week. Immediately following your rolling session, use a moisturizing cream. I highly recommend using a cream that's designed to help heal stretch marks. Any brand is fine so there's no need to be too specific. You can also use organic Vitamin E oil if you live near a health food store;they usually carry it. I know you're not going to like my answer, but it really depends on how severe your condition is. It could take anywhere from 2-4 weeks.I know I just made this sound like a disease, but sometimes (since I suffer from this myself) I really do feel it is one. That's how bad it makes me feel. My confidence has been kicked more than a few times, which is why I'm writing this article. It's time to do something about this! The price will vary by length. The more excess skin you have in the affected area, the longer the needle will need to be. I've seen dermarollers for as little as $7 and some that cost as much as $20. Either way, it's going to cost a lot less and be a lot less painful than receiving laser treatments, which will cost hundreds and even thousands of dollars depending on the size of the area. You'll never had to replace this item unless a few needles break off. I'm not sure how that would happen since your goal isn't to scrub yourself silly, but it is possible even though I'm not able to comprehend how. These also come in a variety of colors so if you're like me and prefer to have useful products that are pretty, then you're going to be able to find something that fits your personality. 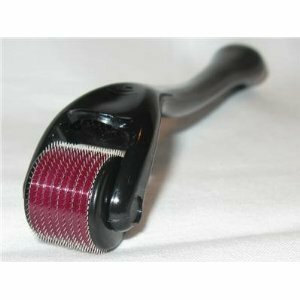 The dermaroller is a great idea for those who haven't had much success in the past with creams and lotions. Perhaps you can put those abandoned bottles to good use now that there is a way to enhance their productivity. Thanks for the article. I never heard of or seen this item. I'll keep this in mind. You're very welcome, thanks for reading!